When a staff member or business partner completes a page of contents, including text, images and linked files, they simply click a link to submit their content for publication approval to the content approval editor (Go Live Authority). 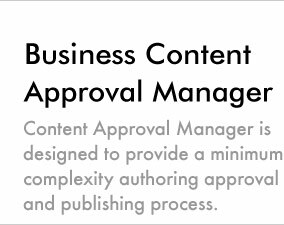 The content approval editor (Go Live Authority) receives a complete copy of the submitted page and file contents at the exact time of the approval request. These content copies are a moment in time snapshot of file and page content material and do not link back to the working source. This prevents an author from changing or updating content after it has been approved and provides complete publication security. These content and file copies are placed inside an encrypted folder, which is kept inside an encrypted secure "Publication Requests" area. 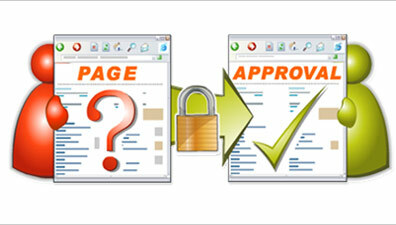 The page approval request notification is then emailed to a designated Go Live Authority at exactly the time a page approval request has been submitted. This email contains a secure link, which the Go Live Authority clicks to view the proposed page and file contents. If the page meets requirements and standards the Go Live Authority can approve it within a single click. This approved material can then be made available on the website. Definition of "Go Live Authority"
Go Live Authorities are people who are trusted to vet and approve page contents for your website, intranet or extranet.